On the eve of the home opener against the Houston Texans, quarterback Tom Brady is back sharing inspirational messages over social media. Over his Instagram account Saturday night, Brady shared an image of himself doing his trademark “lets go!” along with teammates Joe Thuney, Rob Gronkowski, and Stephon Gillmore making appearances. “Fate whispers to the warrior, you cannot withstand the storm… the warrior whispers back…,” the photograph caption states. Entering his 19th professional season , Brady and his “storm” continues to show no sign of letting up. This entry was posted in Patriots Photos and tagged 2018 Patriots season, Joe Thuney, Rob Gronkowski, Stephon Gillmore, Tom Brady on September 8, 2018 by Robert Alvarez. The Patriots entered the 2017 Divisional Playoffs as heavy favorites over the upstart Tennessee Titans, but were seeking to advance to their seventh consecutive AFC championship game. In the first quarter, it was the Titans who drew first blood, as Marcus Mariota found an unlikely target for his first touchdown, rookie Corey Davis who got his first career NFL touchdown reception in the most important of games. 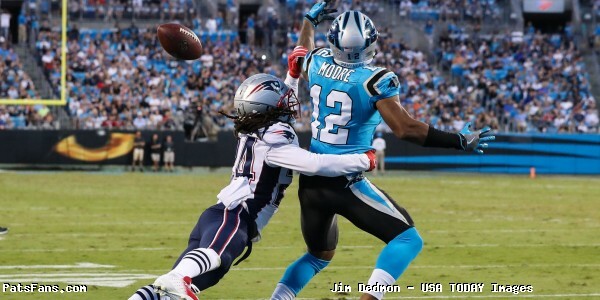 An incredible one handed highlight grab to stun the Foxboro faithful early on. Seeking a response after struggling to find a rhythm in the first quarter, the Patriots opened the second with a long drive that resulted in the game tying score on a quick catch and run by James White. Two drives later, same guy, same result. The Patriots would jump ahead 14-7 for their first lead of the game, they would not relinquish it. Chris Hogan, who battled injuries throughout 2017 that resulted in him missing seven of the final eight regular season games, only caught one pass in this game, but made it count. 21-7 Patriots heading into halftime. In the second half, with running back depth thin due to the absence of Rex Burkhead and Mike Gillislee, Brandon Bolden saw surprise action against the Titans, and scored his first touchdown since 2015. 28-7 Patriots. That's Brandon Bolden's first touchdown since Nov. 29, 2015. The Patriots opened up a 28-7 lead after three quarters and the rout was on. Seeking to put the finishing touches on yet another divisional round victory, Tom Brady found Rob Gronkowski, and of course, a Gronk spike ensued. The Patriots defense played a big role in keeping the Titans offense out of the end zone, allowing just two touchdowns all game, the second coming in garbage time when Mariota found Corey Davis again to bring the final score to 35-14. Make that 8 sacks on the night for the #Patriots. Franchise record in the playoffs. The defense did work last night, setting a new franchise postseason record with 8 sacks. Bill Belichick and Tom Brady are the winningest coach and quarterback tandem in the postseason at 26 wins. 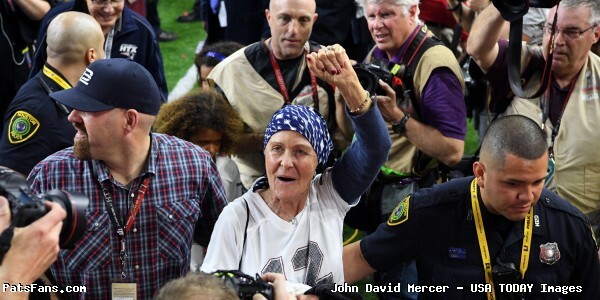 This entry was posted in 2017 Patriots Postseason, Patriots News, Patriots Photos, Patriots Twitter, Patriots Video and tagged Brandin Cooks, Brandon Bolden, Deatrich Wise Jr., Deion Branch, Dion Lewis, James Harrison, James White, Julian Edelman, Rob Gronkowski, Stephon Gillmore, Tom Brady on January 14, 2018 by Robert Alvarez. Entering Sunday’s matchup with the Pittsburgh Steelers, the rivals squared off with the winner seeking the AFC’s number one seed and home field advantage for the playoffs with three games to go in the season. 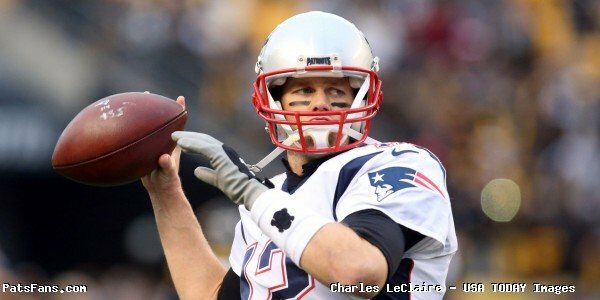 Tom Brady came into the game seeking to continue his dominance over the Steel City sporting a 7-2 regular season record. Tom Brady was booed as he ran toward midfield for pregame warmups, so he waved back at the crowd to tell them to get louder. Let fireworks begin! I got my popcorn! In the first quarter, the Patriots struck first, with Brandin Cooks immediately rebounding from last weeks struggles as he hauled in a 43 yard deep ball from Tom Brady which help setup the games first touchdown. Running back Rex Burkhead would bang it in from the goal line for an early 7-0 lead. The Steelers dynamic offense wasted no time and quickly responded to tie the game at 7 when quarterback Ben Roethlisberger found Eli Rogers on this 18 yard touchdown strike. 7️⃣➡️1️⃣7️⃣ to get things started. In the second quarter, both teams traded field goals to knot the score at 10, but Steelers wide receiver Martavis Bryant and Patriots tight end Rob Gronkowski provided some highlights leading to the scores. With the clock winding down on the first half, the Steelers found the end zone for a second time when Roethlisberger found Bryant and the Patriots headed to the locker room trailing, but only by 7 at 17-10. The Patriots got the ball to open the second half, and in what would be a recurrence all night long, Gronkowski continued to haul in big yardage. Get it to the Gronk. The reception would lead to Brady’s first touchdown pass of the game, but a Stephen Gostkowski extra point was missed, and the Patriots had to settle trailing by one at 17-16. Like in the first quarter, the Steelers again responded as another member of the “Killer B’s” found the end zone when Le’veon Bell ran the ball in from the three, 24-16 Steelers after three quarters. In the fourth quarter, the Patriots defense began to tighten up for the first time all game despite third down struggles, and Tom Brady drove the Patriots into field goal range for Gostkowski to cut the deficit to five at 24-19. With two minutes to go in the game, the Patriots were given one more opportunity to retake the lead following a big third down stop. Brady and Gronkowski went to work. Courtesy of three big receptions for 69 yards, Gronkowski helped setup the go ahead score, an eight yard run by the former Pitt Panther Dion Lewis. 27-24 Patriots. Rob Gronkowski on that drive: 69 yards. Best moment of his life. After the #Patriots’ 2-pt conversion, @RobGronkowski started celebrating for the camera. The clock had just under a minute for Big Ben to try and rally, and his rookie wideout Juju Smith-Schuster provided instant life on an incredible 69 yard catch and run. The play setup what appeared to be tight end Jesse James game winning touchdown, but the play was reviewed and ruled not a catch by the officals. Forget the lunge. He's going to the ground and the ball hits the ground. Despite the controversy that ensued the Steelers still had time for another play despite no timeouts, but instead of spiking the ball to setup a game tying field goal, Roethlisberger gambled with a pass, and the result was Duron “The Closer” Harmon. An incredible goal line stand that brought back memories of Super Bowl XLIX, and the Patriots survived and won in Pittsburgh yet again while taking over the number 1 seed in the AFC and another division title. A 27-24 final in a thriller and just two divisional games at home remain where the Patriots control their destiny for playoff positioning. Patriots now have won the AFC East division title, marking the ninth consecutive division title for New England (2009-17), the longest streak in NFL history. There goes the G.O.A.T. with another win in Pittsburgh! That’s was a great football game, the 2 teams have a lot respect for each other even with all the @&$% talking going on.. This entry was posted in 2017 Patriots Season, Patriots Twitter and tagged Andre Tippett, Brandin Cooks, Brandon Bolden, Deatrich Wise, Devin McCourty, Dont'a Hightower, Eric Rowe, Jacob Hollister, James White, Julian Edelman, Kyle Van Noy, LaAdrian Waddle, Lawyer Milloy, Raymond Clayborn, Rob Ninkovich, Sebastian Vollmer, Stephon Gillmore, Tom Brady, Troy Brown, Vince Wilfork on December 20, 2017 by Robert Alvarez. Entering their Week 12 match up with the Miami Dolphins, the New England Patriots were beginning a stretch of five pivotal AFC East divisional games in six weeks to close out the regular season. In the first quarter, it appeared the Patriots had been forced to punt to open the game, but a little trickery from Bill Belichick kept the drive alive. Unfortunately, it came at a cost, as Nate Ebner went down with a non-contact injury on the run and was lost for the season. League source also confirms #Patriots safety Nate Ebner will be placed on IR after suffering knee injury vs. Dolphins. Was having another All-Pro caliber season. The fake punt setup the first score of the game following this deep pass from Tom Brady to Phillip Dorsett. Running back Rex Burkhead would score from inside the 10 to put the Patriots ahead 7-0. Since 2001 in the regular season, when scoring first the Patriots are 142-26. It didn’t take long for Brady to attack the Dolphins secondary, as he found tight end Rob Gronkowski towards the end of the first quarter to put his team up by two scores and set some Gronk records in the process. * Now top-10 all time in receiving yards for a tight end. Passed Kellen Winslow. * Career touchdown No. 73 for the Brady-to-Gronkowski connection means they've passed Brees-to-Colston for fifth all-time. Just when it appeared the Patriots were going to run away and hide, backup center Ted Karras, who was replacing the injured David Andrews, botched a snap that was recovered and returned by the Dolphins defense to cut the score in half at 14-7. Needing a response, Brady found Brandin “Cookie” Cooks deep to setup a third touchdown score of the day to open up the second quarter. 3rd-and-14? Time to shoot some arrows. Brady would find Rex Burkhead for a second time, this time on the receiving end. 21-7 Patriots. The defense would allow a field goal to cut the score to 21-10, but they also made big plays when needed most, including this clutch interception by cornerback Stephon Gillmore just before halftime. The Dolphins were inside the Patriots 20 but lost out on any points. 21-10 Patriots going into the half. In the third quarter, Tom Brady continued to throw right at the Dolphins backfield, and connected for a second time to Rob Gronkowski to extend the lead to 28-10. The Dolphins were kept out of the end zone until the fourth quarter, where Kenyan Drake hauled in a Matt Moore touchdown. It would be the only Dolphins offensive touchdown of the game. 28-17 Patriots. Another Dolphins field goal cut the lead to 28-17, but any chance of a comeback was killed as Brady drove the ball down the field for a back breaking “shuffle” touchdown pass to Brandin Cooks to go up 35-17. Sometimes @brandincooks catches long passes for TDs. Despite a few miscues early on, the 35-17 score would stand as the Patriots earned their ninth victory of 2017 and their seventh in a row. #Patriots streak of allowing 17 points or fewer up to 7 straight games. Longest streak since 2006. The franchise record is 9 straight games in 1993. 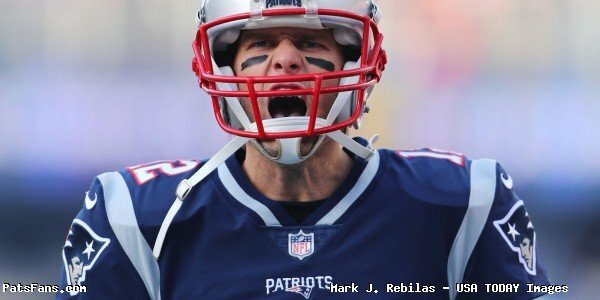 Patriots clinched their 17th consecutive season with a winning record, the longest streak since 1970, surpassing the previous record of 16 held by the 1970-1985 Dallas Cowboys and 1983-1998 San Francisco 49ers. Hey Danny, don’t worry kid, you can go for the next ride! #giddyup yeee!! This entry was posted in Patriots Photos, Patriots Video and tagged Brandin Cooks, Dion Lewis, Dont'a Hightower, Julian Edelman, Rob Ninkovich, Stephon Gillmore, Tom Brady on November 30, 2017 by Robert Alvarez. Heading into their matchup in Mexico City with the Oakland Raiders, the Patriots were seeking their eighth win of 2017 and some separation in the AFC East as the final stretch of the season began. In the first quarter the Patriots owned time of possession early, as Dion Lewis found the end zone to put the team up 7-0 after one. Quarterback Tom Brady was red hot to open the game, with a perfect 12 for 12 on completions. TV STAT: Tom Brady last started a regular season game 12/12 against the Colts back in 2003. He just matched that total with that last completion to Bennett. The defense continued its rebound, as cornerback Duron Harmon kept the Raiders from answering with an interception. 7-0 Patriots after a quarter. In the second, Brady continued to attack the Raiders secondary as he connected with Brandin Cooks deep to setup the Patriots second touchdown of the game. On third and goal, the usually clutch Danny Amendola came up big again, and it was 14-0 Patriots midway through the second. Just before halftime, it appeared the Raiders were going to get back in the game, but the Patriots defense had other ideas in the red zone. A big stop by the defense. Despite under a minute to play in the half, Tom Brady’s offense continued to find ways to swipe points before time ran out. The high altitude of “Estadio Azteca” turned out to be kicker Stephen Gostkowski’s ally. Tom Brady goes over 3,000 yards for the 15th time in his career, the third-most all-time (Favre 18, Manning 16). Heading into halftime, the Patriots found themselves up a commanding 3 possession lead at 17-0. Getting the ball to start the third quarter, Brady again found Cooks deep, a 64 yard bomb to the end zone and a 24-0 lead. 1. Catch a 64-yard TD. Pretty crazy, but that 64-yarder was only the fifth longest TD catch of Brandin Cooks’ career. Kicker Stephen Gostkowski continued his big day and kicked two more field goals from 40 and 51 to extend the lead to 30-0 after three quarters. In the fourth, Brady earned an early exit as Brian Hoyer took over for the remainder of the game. The Raiders would get a garbage time touchdown from Amari Cooper and a two point conversion to spoil the shutout, but Gostkowski’s fourth field goal of the game capped off the blowout 33-8 victory in Mexico. 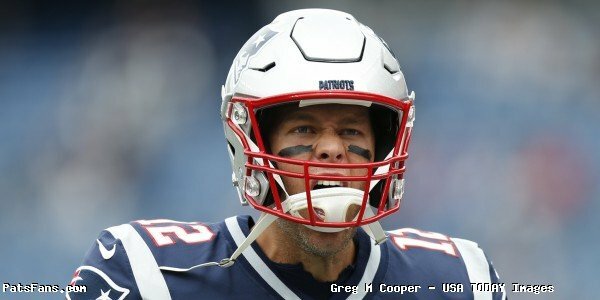 Patriots clinched a .500 or better record for 17th consecutive season, tying 1957-73 Cleveland Browns for second-longest streak in NFL history, behind only 1965-85 Dallas Cowboys and their 21 consecutive seasons. This is just the sixth time in franchise history that the #Patriots have held their opponents to 17 points or fewer in six straight games. The franchise record is 9 straight in 1993. This entry was posted in Patriots Commentary, Patriots Photos, Patriots Video and tagged Brandin Cooks, Chris Hogan, Devin McCourty, Dion Lewis, Duron Harmon, Jonathan Jones, Kyle Van Noy, Malcolm Butler, Stephon Gillmore, Tom Brady on November 23, 2017 by Robert Alvarez.